Strange circumstances surrounding the crime pique the interest of a journalist and a blind crossword compiler whose sharp ears have overheard talk of blackmail. However, all those assisting the would-be investigators in their crime solving soon begin to regret becoming involved as scientists die in front of speeding trains and photographers are viciously slain, while others fall to their screaming deaths down elevator shafts. It soon becomes clear that the killer is on to the investigative duo and will do anything to protect his identity. The Cat O' Nine Tails, Dario Argento's second feature as director, stars James Franciscus (Beneath The Planet Of The Apes; The Valley Of Gwangi), Karl Malden (The Streets Of San Francisco; On The Waterfront; A Streetcar Named Desire) and French actress and singer Catherine Spaak (Hotel; La Ronde; The Easy Life) in a classic Giallo tale that begins when a break in at a genetics lab leads to a spiralling vortex of bloody murder. The Cat O' Nine Tails (cert. 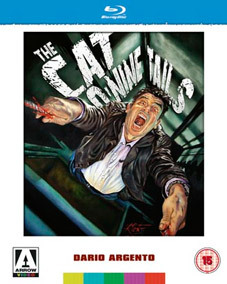 15) will be released on Blu-ray by Arrow Video on 26th September 2011 at the RRP of £24.99. Exclusive collectors' booklet featuring brand new writing by Alan Jones, author of Profondo Argento.